Instead I was reading books on prophecy and told her, “I’ve got to find out what this is all about. They’re not teaching it in school.” And as I would study these things, I felt God building me. There is a blessing to be found in a study of prophecy. It would be better for you not to know these things than to know them and to be idle about them. There’s nothing that fuels the flames of evangelism like a proper understanding of prophecy. When was the last time you read the book of Revelation? Maybe you can start on it today! Each day you will begin with a nugget from one of his messages, a reading from God’s Word, and a place to write your “Spiritual concerns and prayer requests.” Order your copy today. 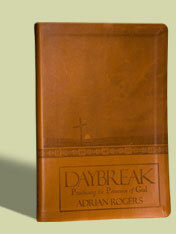 For more Adrian Rogers’ resources you may visit the Love Worth Finding bookstore at www.lwf.org.